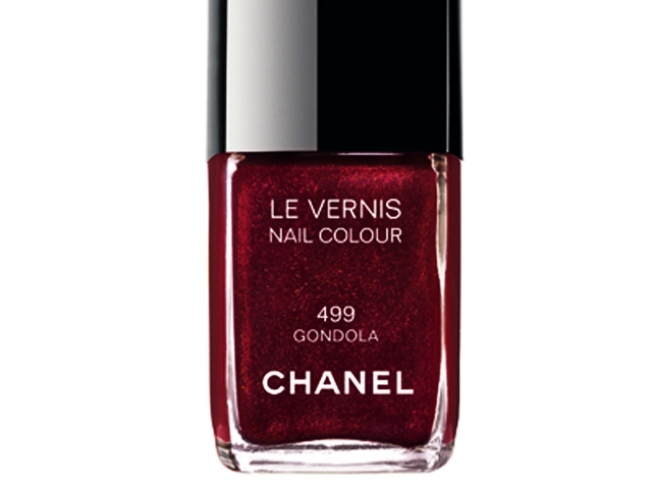 Gondola, one of the Le Vernis colors of Chanel's fall 2009 collection. PIANISSIMO Chanel’s Fall 2009 makeup revolves around the romance of Venice – lots of arlequin this and intermezzo that -- and we fell hard for a shimmery plum hitting the Le Vernis Nail Color line. The name is Gondola (of course) and it’s got us wanting to channel the gorgeous Julie Christie in "Don’t Look Now" (which is how we experience Venice via Netflix). $23 at Bloomingdale’s, 1000 Third Avenue between\n 59th and 60th Streets; 212-705-2000. QUEEN FOR A DAY (OR TWO) It’s the sample sale you’ve been waiting for: Spring and summer 2009 apparel for men and women, plus shoes, bags and accessories galore, will be 80% off at the Alexander McQueen sample sale. (There’ll also be some goodies from seasons past.) August 4 and 5 at the Metropolitan Pavilion, 125 West 18th Street near Sixth Avenue; 212-463-0071. BAUBLES Jewelry designer Jennifer Zeuner’s creations are a study in contrast: wispy gold chains here, chunky ebony beads and vermeil lettering there. Stop by today for a look at her newest pieces (hint: lots of charms) at the Jennifer Zeuner trunk show at Bergdorf Goodman from 2-6PM. 754 Fifth Avenue/58th Street; 212-753-7300; jenniferzeuner.com.